Introduction: In today's health-care services, there is no clear-cut role of each profession. These roles have been shaded or blended with the roles of each other professions, which shows an interconnection between each profession. Interprofessional learning is an approach of learning with each other's professional knowledge and skills. This type of learning will be helpful for the students to enhance their knowledge, skills, interaction, and provision of health-care services. Aim: The objective of this study was to assess the attitude of dental undergraduate students toward interprofessional learning. Materials and Methods: This descriptive questionnaire study was conducted on dental undergraduate students in Mysore city. A total of 250 dental students were selected using stratified random sampling method. Data were collected using a questionnaire on Readiness for Interprofessional Learning Scale. Results: Among the 250 dental undergraduate students who completed the survey, 27.6% (n = 69) were males and 72.4% (n = 181) were females. Nearly 84% (n = 210) showed positive attitude toward team work and collaboration as a result of shared learning and 16% (n = 40) had negative attitude. When asked about their view toward professional identity, 85.6% (n = 214) felt that interprofessional learning will help them understand their professional identity better and 15.4% (n = 36) disagreed it. Conclusion: Dental undergraduate students in general have a positive view toward interprofessional learning. IPE is defined as “two or more professions learn with, from and about each other to improve collaboration and the quality of care.”, IPE is the process of learning in a systematic manner by sharing the knowledge and skills of different professions. IPE provides foundation for health-care students from various disciplines before starting with their workforce. It gives an opportunity for students to interchange their views, approach, and treatment plans as well as to have a good interrelationship with same and other professions. With this type of education, students' critical thinking aptitude and learning styles can be improved which directly helps in the betterment of quality of health care. IPE enables nondental health professionals to understand the relationship between oral health and overall health and quality of life. It also promotes an appreciation for the role of the dental team in preventive care and the importance of screening and referral for various oral diseases and conditions. Recent studies have shown that prior experience with interprofessional learning helps in improving professional identity and attitudes toward teamwork. Collaborative work will reduce the duplication and proper usage of resources as well. Some studies have shown that undergraduate level is the best time for interprofessional learning that helps the students to develop positive attitudes for their future professional life. Hence, this survey had been undertaken to assess the attitudes/perception and barrier of interprofessional learning among dental undergraduate students. The study was carried out at a dental college and hospital, Mysore, Karnataka, India. The undergraduate course is 4 years with 1 year of compulsory rotatory internship. Permission was obtained from the Ethical Committee and the head of the institution prior to initiating the study. A descriptive questionnaire survey was conducted among undergraduate dental students in Mysore city. With a target population of 600 undergraduate dental students in Mysore city, the estimated sample size was calculated to be 83. To ensure adequate sample size in light of anticipated nonresponsive rates, this estimate was tripled leading to a final sample size estimate of 250. By stratified random sampling, fifty students were selected randomly from all the 5 years of undergraduate students. Sample size was calculated via a construct variable defined as achieving ≥80% on a set of attitude-based questions, by expecting 50% of respondents to achieve this score (with a 10% margin of error) and setting α = 0.05. Students who were present on the day of survey and gave informed consent were included in the study. Subscale 3: Roles and responsibilities. The teamwork/collaboration subscale assesses the valuing of cooperative learning and respecting students from other health-care professionals and the negative professional identity subscale measures the tendency of an individual to value and benefit from collaborative relationships with other health-care professionals. The roles and responsibilities subscale measures the practical application of interprofessional skills with other health-care professional students. Both subscale scores and total scores can be rated. Overall, high scores indicate a more positive attitude toward interprofessional learning experiences. It can be used to measure responses to specific interprofessional learning experiences or formatively for planning IPE activities. A survey was conducted for 3 weeks and it took approximately 8 min for the participants to complete the questionnaire. All the data were subjected to analysis using SPSS version 17.0 (SPSS Inc., South Wacker Drive, Chicago, IL, USA) where descriptive statistics and ANOVA were used. P < 0.05 was considered statistically significant. The response rate was 100%; 27.6% (n = 69) of respondents were males and 72.4% (n = 181) were females. Nearly 84% (n = 210) showed positive attitude toward team work and collaboration as a result of shared learning and 16% (n = 40) had negative attitude. When asked about their view toward professional identity, 85.6% (n = 214) felt that interprofessional learning will help them understand their professional identity better and 15.4% (n = 36) disagreed it [Table 1] and [Table 2]. There was no statistically significant difference between the groups (P = 0.30). 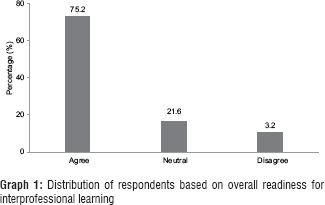 Almost 75.2% of respondents showed their agreed response for interprofessional learning [Graph 1]. This study showed that dental students (participants) had positive attitude toward shared learning, which shows their agreement that interprofessional learning method will improve the work efficiency and better understanding of the participant. Similar response was present in other studies conducted by Stephanie Chan et al., Cashman et al., and Wilcock et al. The results signify improved communication and cooperation between groups. However, studies by Reeves and Dalton et al. were contradictory to our study. This might be due to unawareness regarding different health professionals' duties, institutional constraints, and time constraints to implement the changes, planning, and resource difficulties. Some of the studies suggested that IPE or learning should be imparted before the students enter their clinical level. This will prevent the development of negative attitudes and make them learn about evidence-based and team-based practice in the future. This will also help the students to inculcate some social and ethical responsibilities toward their practice., Studies, have shown the effective role of IPL in increasing the knowledge and skills of health-care professions as well as providing opportunities for working as a multidisciplinary team. Frequently, the effectiveness of team work depends on team leader, who should be dictated by the context in which the team operates and this may not necessarily be the doctor. Providing a balanced membership in the team and ensuring that the course is attractive to learners through its contact and relevance are effective factors that should be considered prior to implementing shared learning programs. The prestige, status, and experience of participants should also be taken into account. Including such programs regarding shared learning and increased teamwork helps to render the quality of health care. The limitation of the study includes small sample of dental students of one dental college which is not entirely representative of Indian dental students. Studies which involve the use of questionnaires entail bias. Further studies are essential to explore the effectiveness of IPE at different levels. Dental undergraduate students have positive attitudes toward learning with other professional students and improve their knowledge and skills, which is a requisite for benefits of the patient or the community as a whole. We acknowledge Dr. Sunitha S for her guidance. Duncan M, Alperstein M, Mayers P, Olckers L, Gibbs T. Not just another multi-professional course! Part 1. Rationale for a transformative curriculum. Med Teach 2006;28:59-63. Takami M, Ayumi T, Tokie A, Eriko T, Tetsuhiro M, Akira H. Japanese student's perception of their learning from an interprofessional education program: A qualitative study. Int J Med Educ 2013;4:9-17. Hood K, Cant R, Baulch J, Gilbee A, Leech M, Anderson A, et al. Prior experience of interprofessional learning enhances undergraduate nursing and healthcare students' professional identity and attitudes to teamwork. Nurse Educ Pract 2014;14:117-22. Curran VR, Sharpe D, Forristall J. Attitudes of health sciences faculty members towards interprofessional teamwork and education. Med Educ 2007;41:892-6. Stone J. Interprofessional Collaborative Practice – Definitions and Terminology: Attempting to Speak the Same Language. Canberra: ACT Health; 2009. Centre for the Advancement of Interprofessional Education. Interprofessional Education: A Definition. London: CAIPE; 1997. Williams B, McCook F, Brown T, Palmero C, McKenna L, Boyle M, et al. Are undergraduate health care students ‘Ready for interprofessional learning? A cross sectional attitudinal Study. Int J Allied Health Sci Pract 2012;10:1-11. Parsell G, Bligh J. The development of a questionnaire to assess the readiness of health care students for interprofessional learning (RIPLS). Med Educ 1999;33:95-100. Chan S, Karen T, Vincent LC, Lauren DM, Glen O, Bruce W, et al. Dissecting through barriers: findings from a pilot study on the effect of interprofessional education in a gross anatomy course. MUMJ 2011;8:11-5. Cashman S, Reidy P, Cody K, Lemay C. Developing and measuring progress toward collaborative, integrated, interdisciplinary health care teams. J Interprof Care 2004;18:183-96. Wilcock PM, Campion-Smith C, Head M. The Dorset Seedcorn project: Interprofessional learning and continuous quality improvement in primary care. Br J Gen Pract 2002;52Suppl:S39-44. Reeves S. Community-based interprofessional education for medical, nursing and dental students. Health Soc Care Community 2000;8:269-76. Dalton L, Spencer J, Dunn M, Albert E, Walker J, Farrell G, et al. Re-thinking approaches to undergraduate health professional education: Interdisciplinary rural placement program. Collegian 2003;10:17-21. Horsburgh M, Lamdin R, Williamson E. Multiprofessional learning: The attitudes of medical, nursing and pharmacy students to shared learning. Med Educ 2001;35:876-83. Hossein D, Mandana S, Seyed AY. Interprofessional learning: The attitudes of medical, nursing and pharmacy students to shared learning at Tehran University of Medical Sciences. Thrita J Med Sci 2012;1:44-8. Areskog NH. The need for multiprofessional health education in undergraduate studies. Med Educ 1988;22:251-2. Davies C. Getting health professionals to work together. BMJ 2000;320:1021-2. Lowry S. Trends in health care and their effects on medical education. BMJ 1993;306:255-8. Reid T, David A. Primary care nursing. Community nursing practice management and teamwork. Nurs Times 1994;90:42-5. Ho K, Jarvis-Selinger S, Borduas F, Frank B, Hall P, Handfield-Jones R, et al. Making interprofessional education work: The strategic roles of the academy. Acad Med 2008;83:934-40. Lavin MA, Ruebling I, Banks R, Block L, Counte M, Furman G, et al. Interdisciplinary health professional education: A historical review. Adv Health Sci Educ Theory Pract 2001;6:25-47. Blue AV, Mitcham M, Smith T, Raymond J, Greenberg R. Changing the future of health professions: Embedding interprofessional education within an academic health center. Acad Med 2010;85:1290-5.